He is suspected of unlawful restrait of Metropolitan Volodymyr's aide. The Prosecutor-General's Office (PGO) of Ukraine is asking parliament to lift the immunity of Opposition Bloc MP Vadym Novynskyy, PGO chief Yuriy Lutsenko has said on Facebook. The MP is suspected of putting illegal pressure on the Ukrainian Orthodox Church with a view to ousting late Metropolitan Volodymyr. In particular, he is suspected of unlawful restraint of the metropolitan's personal assistant, Oleksandr Drabynko (Article 146 Part 2 and Article 365 Part 1 of the Criminal Code). The document posted by Lutsenko says that from September to December 2013 MP Novynskyy was complicit in "crimes against the will, honour and dignity of a person and in his office activities". As the owner of Smart Holding, he is one of the wealthiest people in Ukraine. He owns a large stock in Metinvest, the HarvEast agricultural holding, the Regal Petroleum oil and gas company, the Kherson Sipyard and the Black Sea Shipyard. Novynskyy was granted Ukrainian citizenship by ex-President Viktor Yanukovych "for outstanding merits to Ukraine. This happened on the eve of the MP's birthday. 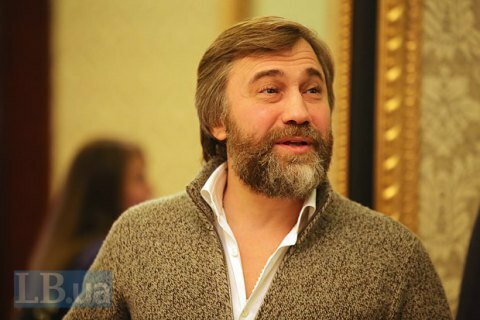 In a recent TV interview on the air of Sonya Koshkina's Left Bank show, Lutsenko said that Metropolitan Volodymyr's death was premature and forced. Ukrainian special police holds airport drill to nab "Russian mafia"